This week I worked with an explorer who was struggling to feel confident, in order to move forward and make a map. She said she wasn't confident enough to talk about her work with anyone, not confident in herself enough to move forward. And I nodded along thinking, Yes, that's right. Of course you don't. Because, darling, you don't start confident. Rarely do I meet a maker who is certain she is smart and capable enough to really, truly do what she wants to do. Oh, we all have moments of hope and inspiration and I can do it!…followed by stretches of Oh Lord, what was I thinking? Confidence is something you build. You become confident in your work by making more of it. You become confident in talking about your work, by talking about it, practicing, learning what your customers respond to. You become confident in yourself, by doing what scares you, by adventuring forward, even when you're not sure. Sometimes, the Doing will build confidence all on it's own. I think we look around at our world and we see bloggers blogging, makers making, and everyone selling, selling, selling and we think that it comes so easy for everyone else. That it must just be us that it's awkward for. But, oh honey, that's just not true. I have a Starship full of people who, despite being rockstars in their fields, regularly back down from making a clear request, from writing a compelling description, from asking for the sale. They stumble and fumble and doubt. They have total crises of confidences. So do I. Sometimes, right here, out loud. That's why I build in weekly yay-ing. Every week we share what went well. Every month we spot what's working. And every quarter we revisit our goals and celebrate the milestones. 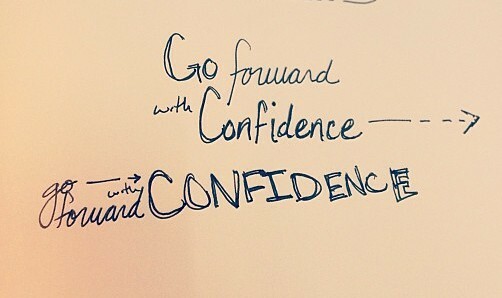 This way, we can remind ourselves of our boldness and that build confidence. It's not that the bloggers and makers and sellers are more confident. They are just doing it. (really). They (and you!) build confidence by a steady cycle of doing + rejoicing over the doing. What can you rejoice in doing, to remember your confidence? You build confidence with a steady cycle of DOING and REJOICING over the doing. Such a great reminder!! Succinct and well-written (like always). Glad I found you as I was “seeking new life”. You are a great addition to the voices around me.